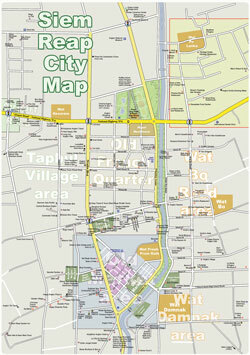 Shops and businesses of various types stretch along Sivutha Blvd from Route #6 to the Old Market area - souvenir shops, convenience stores, banks and money changers, massage shops, travel agencies, photo shops and more. LuckyMall on Sivutha in the center of town contains Lucky Supermarket, Lucky Burger, U-Care and a dozen other stores. Convenience stores are located all over town with several along Sivutha Blvd, all offering selections of groceries, sundries, drinks and more. Shops and businesses of various types stretch along Sivatha Blvd from Route #6 to the Old Market area - souvenir shops, convenience stores, banks and money changers, massage shops, travel agencies, photo shops and more. LuckyMall containing Lucky Supermarket, Monument Toys & Books, Lucky Burger, U-Care and a dozen other stores is the newest addition to international-style shopping scene. Convenience stores are located all over town with several along Sivatha Blvd, all offering selections of groceries, sundries, drinks and more. Sivatha Blvd, Siem Reap, Cambodia. Just off of Pub Street, Angkor Mini Mart is a 24-hour market that carries a surprisingly good selection. Sivatha Blvd., in the LuckyMall, Siem Reap, Cambodia. Airport Road international-style convenience store. Airport Road (Route #6), Siem Reap, Cambodia. Complete convenience store, a/c shopping, snacks, drinks and sundries. Full pharmacy on premises. On the corner, river road, one block from Old Market, Siem Reap, Cambodia. 1) Old Market area (at the end of Pub Street), Siem Reap, Cambodia. 2) Lucky Mall on Sivutha Blvd, Siem Reap, Cambodia. 3) Siem Reap International Airport, Siem Reap, Cambodia. 4) Cultural Mall at the Angkor National Museum, Siem Reap, Cambodia. Photo shops Photo shops are located across the town, all offering digital services and most film services as well. Several dot Sivutha Blvd through the center of town. Long established photo shop and studio. Digital photo services and film processing. Studio and photographers. 1) Sivutha Blvd corner of St.03, Siem Reap, Cambodia. 2) National Road #6, Siem Reap, Cambodia. 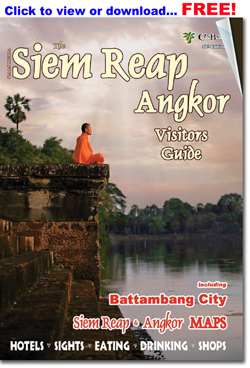 Most book vendors in Siem Reap focus on Cambodia and Southeast Asia related books, Angkor temple guides and travel books. Some places offer proper, original copies but most sell bootleg versions at cut-rate prices. Several roving book carts prowl the Old Market area offer selections of the most popular Cambodia related titles. Book stalls on the riverside of the Old Market sell temple guides and Cambodia-related books, as do small vendors near the temples. Used and new books. 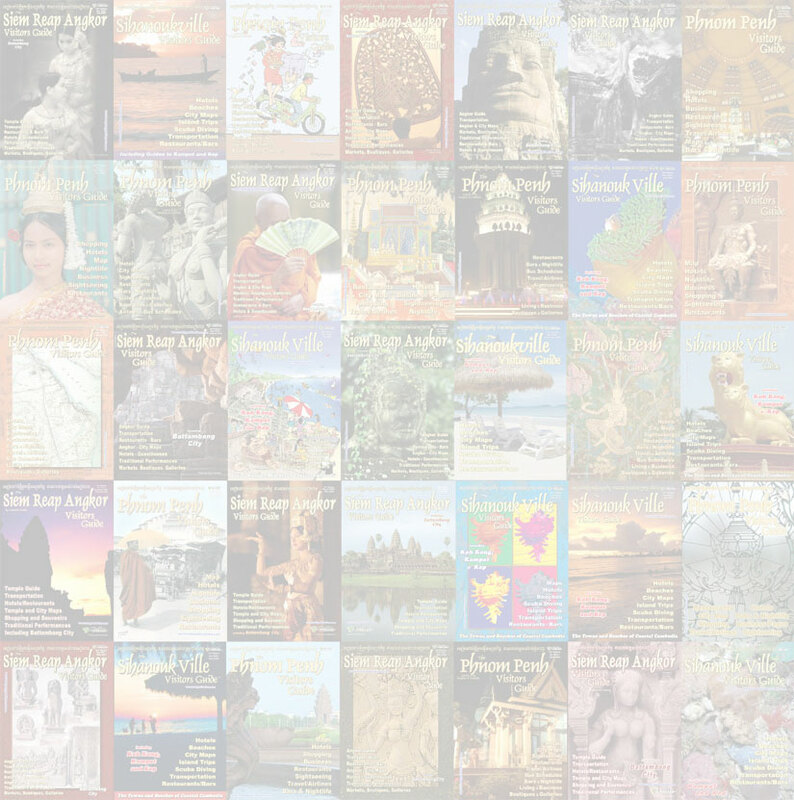 Cambodia titles. Fiction and non-fiction. Street 9, Old Market area, Siem Reap, Cambodia. Used and new books. Cambodia titles. Travel guides. Fiction and non-fiction. 2 Thnou Street, Old Market area, opposite the Provincial Hospital, Siem Reap, Cambodia. New books. Cambodia titles. Travel guides. Fiction and non-fiction. In the Ta Prohm Hotel on Pokombor Av, next to the Old Market, Siem Reap, Cambodia. Old Market area, Siem Reap, Cambodia. 2 Thnou St (Market St), Old Market area, Siem Reap, Cambodia.